Fitness expert Chloe Bent shares her strategy for making the transition from walker to runner a little more seamless. Fitness expert Chloe Bent shares her strategy for making the transition from walker to runner more seamless. As the fitness host for CBC Life's Fit Class Live, I love being active but the last thing I would have ever called myself was a runner…until now. 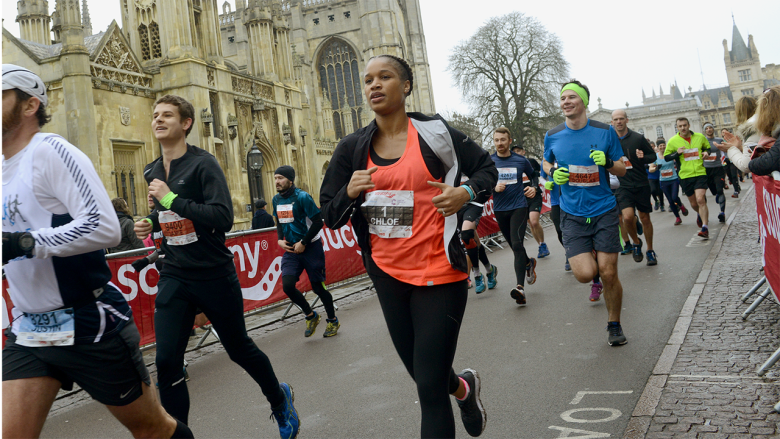 I recently experienced my biggest runner's high when I ran in the Saucony Cambridge Half Marathon. I went from walker to runner in two months and you can too! Here are my tips to help you hit the ground running. "I don't have time! I'm way too tired! I don't look like a runner!" Sound familiar? 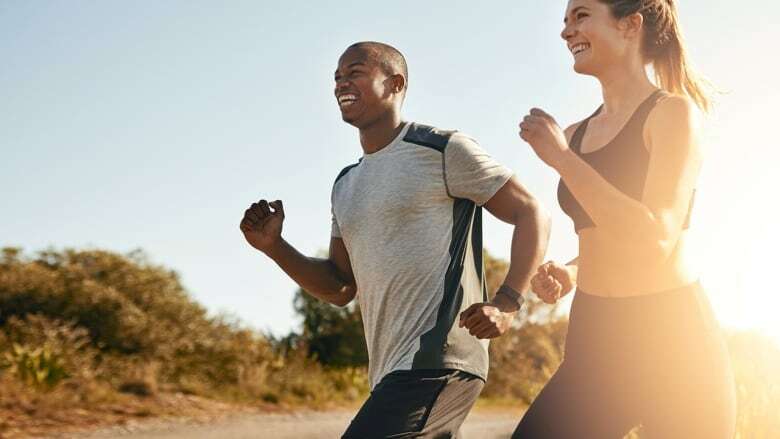 Lack of time is a common excuse for skipping runs or exercise in general, but the World Health Organization recommends that "adults between the ages of 18 to 64 should get 150 minutes of moderate-intensity aerobic activity throughout the week." That's only 22 minutes a day! In other words, by ditching the excuses you could be spending less than 2% of your day strengthening your muscles, improving your cardiovascular fitness and reducing stress. Avid marathoner, writer and podcast host at Canadian Running Magazine, Joan Chung, agrees that people often shy away from running because they don't think they look like a runner. She told me in an interview, "Whether they're referring to body type or clothing and gear, some people may get discouraged from running because they don't fit the 'type', and what they might see as the conventional 'look' of a runner. It's important to keep in mind that even among elite runners there are very different body types and among the general running population the 'look' of a runner varies greatly both in body types and in age range." Find a race online, sign up for it, pay for it and commit to it! There's nothing like a deadline to help get you out the door. Having a race date circled on your calendar is incredible motivation to start running and on days when you don't feel like it, the visual reminder will help you think about how you'll feel if you have to back out of the race or if you don't finish. My first race was a half marathon but I suggest getting your feet wet with a 5K. If you're an absolute beginner, give yourself at least 8 weeks to train for this distance. And if you're curious to see how you'll actually do on race day, parkrun Canada organizes free, weekly 5 km timed runs around Canada and they are open to everyone. When you first start running, it's pretty tempting to just dust off the grungy pair of runners hiding at the back of your closet. Don't do it! Make a visit to your local running shop and try on a few options to make sure you're finding your perfect fit. "Two things to think about when trying on shoes are fit and feel as they unique to everyone," Linda Quinteros, Marketing Manager at Saucony Canada told me. "When it comes to fit, try on shoes while standing up. You'll want to measure a half to the full-width of your thumb between your big toe and the tip of the shoe." Quinteros also suggests not overthinking the process. When it feels right, you'll know it! Perfect for beginners as well as experienced runners, the run-walk method was made popular by Olympian and running coach Jeff Galloway. The method is simple: run for a short segment and then take a walk break. Contrary to what you might think, the technique doesn't mean walking when you're tired, you actually take those walking breaks when you're not. According to Galloway, "walk breaks will significantly speed up recovery because there is less damage to repair. The early walk breaks erase fatigue, and the later walk breaks will reduce or eliminate overuse muscle breakdown." So as a beginner you'll be able to cover more distance with better form and alignment. The plan listed above is a great place to start but there are also plenty of walk-run training plans available online, so with a little bit of research, you'll be sure to find one that works for you. 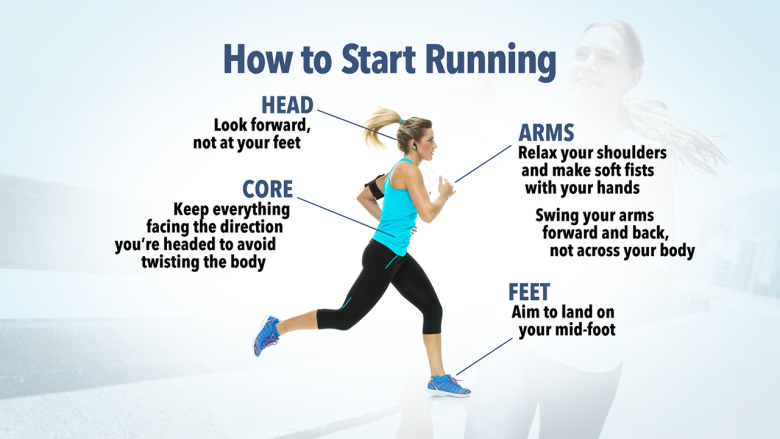 Running form is incredibly important, especially as a beginner. It is critical to prevent injury as you plan to increase your speed and distance. Follow these tips above for proper form to help improve your running performance and carry you to the finish line safely and enjoyably. Try tackling one at a time and once you feel you've mastered it, move on to the next tip. With time and practice, you will piece it all together and run with improved form without even thinking about it. See you at the finish line!